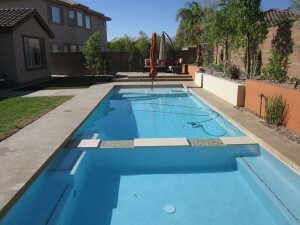 CARING FOR YOUR NEW POOL! Begin filling your pool with water as soon as the plaster is applied and before it dries completely and don't stop until the level reaches the middle of the skimmer. This will prevent severe cracking and a permanent bathtub ring. A minimum of 36 hours are required to fill an average size swimming pool. Never use water softener serviced hose spigots when adding water to the pool. Once the pump and filtration system is operating normally, the main objective is to remove the plaster dust or shale before it can adhere to the newly plastered surface. There are several suggested methods to use. With the filter functioning 12 hours daily, use a nylon bristle brush and thoroughly clean the pool 3 times a day until the water clears. Then remove the dust that has collected in the filter with back flushing. Begin filter operation and set the timer for 8 hours per day for one week. Vacuum the pool SLOWLY and thoroughly using the nylon bristle head of a vacuum. This will collect 90% of the dust into the filter immediately. Backwash and charge the filter, then brush the pool completely with a nylon bristle brush. The water should clear within 24 hours or less. Brushing is recommended once daily for the first week and then once weekly for routine maintenance. While the filtration system removes debris, it won't do anything about the bacteria and algae in your pool. Clean, clear water is achieved by killing the bacteria with a disinfectant, eliminating organic matter through oxidation and keeping the basic elements of the water in balance with one another. 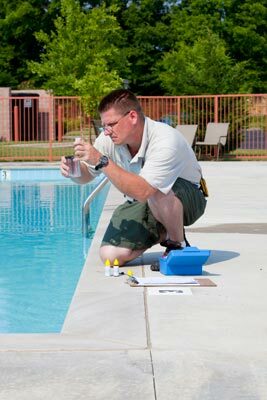 Chlorine or bromine are generally used to purify the pool or spa water since they are both sanitizers and oxidizers. Balancing demands regularly monitoring and properly testing the Ph level, total alkalinity, calcium hardness and total dissolved solids. 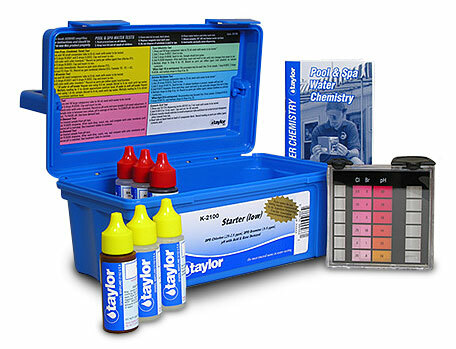 Laguna recommends using the Taylor Test Kit for its well written and accurate testing and treatment guide. Ph is a measurement of the acidity or alkalinity on a scale from 0 to 14. Water measured at the center of this scale (7) is considered neutral. Below the 7 is acidic (lemon juice would be about 3) and above the 7 is alkaline (limestone has a high Ph level). Levels too low on the scale will sting the eyes of swimmers and too high will cause scale to form on the surface of the pool and in the equipment. Keeping the Ph balance between 7.2 and 7.8 is safe for guests and helps sanitizers work at peak efficiency. Total Alkalinity or TA is a measurement of compounds in the water and has a direct effect on the Ph level. Adjust your TA before trying to correct your Ph level. Ingunite pools with unpainted finishes, keep the TA between 80 to 125 parts per million (PPM) and 125 to 150 PPM for vinyl, fiberglass and painted finishes. Calcium hardness refers to the amount of dissolved minerals in water. While soft water is preferred for inside the home, pools and spas benefit from what most would consider hard water. Maintaining the calcium hardness level at 300 PPM is recommended. Total Dissolved Solids or TDS includes everything from chemicals to suntan lotions which normally dissipate in the water but can build up causing it to appear cloudy or murky. Even if the water looks clear, if the TDS level is above 2500 PPM you must drain and refill the pool or spa. Algae is another problem that may require attention. Usually prevented with regular cleaning and proper sanitation, developing algae can be removed by brushing and chemical treatments such as algaecide. 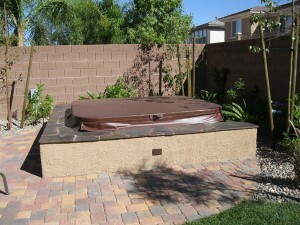 Invest in a cover for your pool and spa. It will reduce overall maintenance costs, especially heating and chemical use, reduce evaporation and can prevent serious accidents involving children or small pets. Unless you have a retractable cover, you will need storage space when it’s not in use. 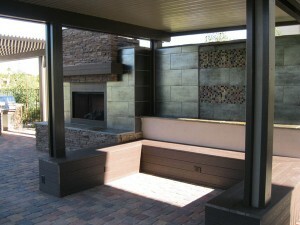 Discuss options with the contractor such as storage disguised as a seating bench. Use a waterproof marker to write the normal operating pressure on the filter. Note the pressure after installing a new or cleaning the old filter. Keep all operating instructions for electric timers easily accessible. What appears to be a major problem could simply be incorrect programming. After a lightning storm, wait at least 20 minutes after the last sound of thunder before getting back in the water. When vacuuming, slowly work around the pool, down the walls and along the floor. Moving too quickly will only stir up the dirt you are trying to remove. 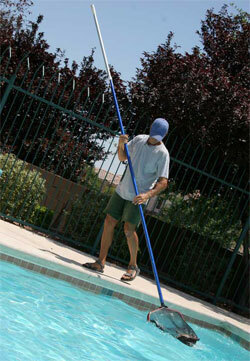 Skimmers are most effective when installed on the downwind side of the pool. The wind will push the debris towards the opening. For maximum efficiency, the pump should be installed no farther than 40-60 feet from the pool. To calculate the volume of water in your pool, multiply the length by the width by the average depth - which equals the cubic feet. Then multiply that number by 7.48 to determine gallons. Always adjust the total alkaline before you adjust the PH. Once the TA is in the proper range, the PH becomes more stable. Two strainer baskets are better than one. An extra one allows you to let the dirty basket dry out for easier debris removal. When adding chemicals, its best to add a little at a time and check the effect, especially with spas. Keep trees and bushes that shed leaves and flowers away from the pool and deck area. Trees planted next to the patio or driveway should be specimens with non-invasive roots. Be sure to allow for growth by not planting a tree or shrub too close to a structure. Take visual weight into account and remember that a large, dark item takes up more space visually than something pale in color and a solid object looks larger than one with open spaces. Plants that are classified “full sun” made need some shade if they are exposed to the reflected light of a swimming pool. Good landscaping can add livability to your pool area by tempering the climate. If a busy schedule keeps you from enjoying the outdoors during the day, plant a white or night blooming garden that is visible and fragrant after dark.